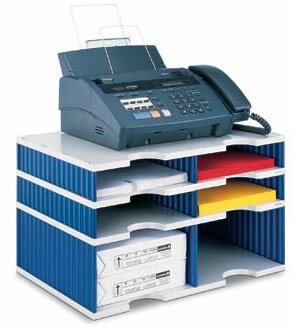 Sorting is a practical and cost-effective pigeon hole system to sort office documents. 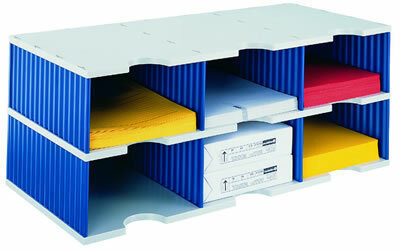 Ideal for using on the desk top or in office storage units. Units comprise three components (base, side and back panels) which are simply and quickly assembled without tools. 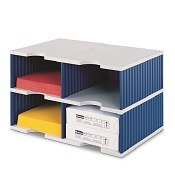 Standard configuration is three compartments wide Base colours: Grey, Black Side/back colours: Red, Blue, Grey, Black Standard Sorting is 57mm high while the jumbo version is 127 high ( internal dimensions) so you have lots more space for collating post. This will take two reams of paper. 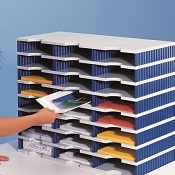 For more information on our range of pigeon holes and to ask for a quotation please contact Home Office Design and we will be pleased to help.